In the early 1950s the Royal Air Force realised that it could streamline its training programmes if jet powered aircraft only were used. As a result of this, a requirement for a new dedicated training aircraft was issued to UK aircraft manufacturers. Originally developed by Percival as a cheap jet-powered derivative of its successful Alvis Leonides, radial-engined Piston Provost, the Jet Provost evolved into an entirely new aircraft. Powered by a Bristol-Siddeley Viper 102 engine, the prototype aircraft (XD674) took its first flight on 26th June 1954. It soon caught the eye of the RAF with its side by side layout and superb handling qualities, and was appreciated enough for the RAF to purchase an initial batch of nine airframes. They were incorporated in a new training syllabus with 2 Flight Training School (2FTS) based at RAF Hullavington, and performed very successfully. As a result of this the Royal Air Force adopted the Jet Provost and ordered 201 T.3s in June 1959, and announced that the 'JP' would become the standard basic RAF trainer. The T.3's differed from the T.1s in having Martin Baker ejection seats, tip tanks, updated cockpit avionics and a clear-view canopy. In November 1961 the RAF issued a follow-on order for a further 198 Jet Provosts T.4's. Powered by an updated Rolls Royce Viper 202 instead of the 102 used in the T.3, these were built and delivered by the British Aircraft Corporation (BAC) until 1964. In 1967 the RAF made a final order for further JPs, this time 105 Jet Provost T.5s. Two prototypes were built by BAC (XS230 and XS231), and the first of these first flew on February 28th 1967. The T.5 was different from the earlier T.4 with a pressurised cockpit, re-designed windscreen, sliding canopy, longer nose and new wings. Deliveries of this type started in the latter years of the 1960's. 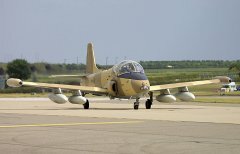 Five T.55's were also built and sold to Oman, and the type also enjoyed success in the overseas market with Sri Lanka, Kuwait, Iraq and Venezuela Air Forces. As a result of the success of the T.5 BAC looked at producing a JP that could also be used as a light attack aircraft as well as a trainer, and the result was the Strikemaster. Changes made to the airframe included 8 stores hard-points underneath the wings, a strengthened airframe and shortened landing gear for use in rough terrains. The prototype Strikemaster first flew in October 1967 and deliveries began as the Strikemaster Mk.80 to the first export customer, Saudi Arabia in late 1968, and many others followed concluding with Sudan in 1984 with the Mk.90. It was replaced by the Shorts Tucano. A number of the surviving aeroplanes were retired and sold into private ownership. As a result, they can now be found across the globe, from the UK to the USA, Australia and New Zealand. 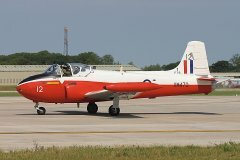 Known universally as the 'JP', the Jet Provost helped introduce the concept of all-jet basic training for pupil pilots in the RAF for the first time, and indeed in any air force around the world.